Nick Riff has been a fixture on the northern Kentucky and Ohio psychedelic and space rock scene since the late 70's and is currently going strong as ever as a solo artist. 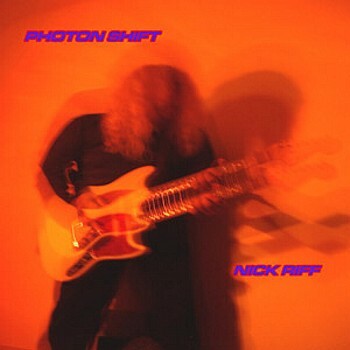 Photon Shift is his third release on the Riffdisc label (in a planned series that will extend into 2012). There are some superb cosmic jams here, with Riff laying down rocking rhythms, lysergic guitar work and spaced out synths, but his focus always remains on song writing, and each song on the album is its own unique piece. Whether he's singing about the ever encroaching embrace of technology, alien abductions, the writings of the scribes of ancient Egypt, or telling us what the mushroom said, the music remains wildly imaginative, exciting and, oh yes, quite freaked out. Kicking things off are two straight ahead rock tunes, Edge of Time and Glowing Bowl, that spill over into their 7+ minute lengths with brilliant acidic guitar work and bubbling cosmic synths. Symbiont starts out in a similar way, but halfway through diverts into a deeply psychedelic, mystical freak out that takes your head away to the far east. The dreamy trip of the 10+ minute title track continues the floating journey, taking the listener through beautiful melodic realms on a slow wave of blissed out sunshine bright psychedelic wonder. The somewhat shorter Already Gone is a heartfelt acoustic ballad about eco-conservation framed by a true and personal story, and is certainly the most touching song on the album, but a very nice break from the almost overwhelming trippiness that had come before, and shows Riff at his song writing best. The nearly 10-minute Mindflow takes us back into space, time and the cosmic mind for some pulsing, hypnotic dance rock. The album closes on a spiritual note, however, with strumming acoustic guitars, deep space chanting and a stroll into the ancient Halls of Amenti. Music fans who like their space rock on the particularly psychedelic and trippy side will no doubt love Photon Shift. Take the journey!